In Buffalo tummy tuck or abdominoplasty surgery has been performed by Dr. Shatkin since 1989. Despite diet and exercise some patients are still unable to improve the contour of the Tummy. 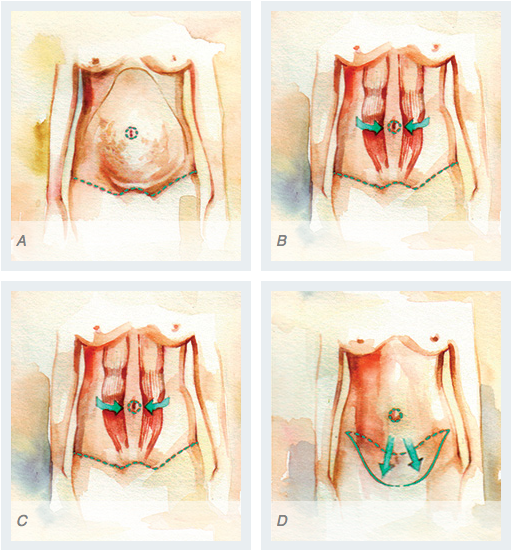 These patients would be good candidates for abdominoplasty or tummy tuck. The abdominoplasty operation essentially is removal of excess skin predominately in the lower abdomen to tighten the skin which may have resulted from multiple pregnancies, weight loss or a combination of these two. The abdominoplasty will often include a tightening of the rectus muscle separation that occurs from multiple pregnancies or weight loss. Many patients may benefit from a mini tummy tuck which is removing and tightening the skin in the lower abdomen and this is often accompanied by liposuction. The abdominoplasty typically requires approximately 1 to 3 hours in the operating room depending on the extent of skin laxity and the areas to be re-contoured. During the surgery Dr. Shatkin will make an incision like a smile in the lower abdomen and raise up the skin to the bellybutton, release the attachment of the belly button and continue to lift up the skin to the rib cage on the sides and the breastbone in the middle. He will then tighten the abdominal muscles that are loose and flex the patient in the operating table and remove the excess skin in the lower abdomen. The bellybutton will then be brought out through the skin in the proper position at the midline. It is common to have drains placed to remove any extra fluid that may accumulate after the surgery. Dr. Shatkin will remove the drains during the recovery, typically anywhere from 4 to 8 days after surgery. Most patients will remain in the hospital for a overnight stay and then be discharged the next morning by Dr. Shatkin. D. Removal of excess skin after Muscle repair, final scar is kept low in the abdomen and hidden under clothing. The abdominoplasty patient will be required to rest at home following the surgery until Dr. Shatkin releases them to go back to their normal light activity. In most cases the patients can resume light activity after 5 to 7 days and they return to work shortly after that. Return to work will certainly depend upon the activity and physical requirements of their job. Dr. Shatkin typically allows the patient to drive after approximately 7 to 10 days. The risks and complications will be discussed with the patient during the consultation with Dr. Shatkin and his staff. Carefully following proper instructions will limit the amount of problems that may occur and allow for a quicker return to normal activity.